The combination of dry and windy conditions. 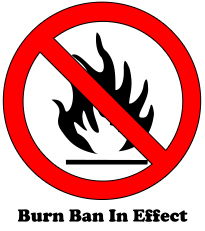 along with remaining brush from the winter has triggered several burn bans in Osage County during recent weeks. Feb. 27 and 28 have both been declared no burn days in Osage County, with an additional fire weather warning declaration made at 4 a.m. this morning. “With dry conditions we remind everyone to use extreme caution when conducting any type of outside burning,” said Bryce Romine, Osage County emergency management director. “Please insure that you have sufficient manpower, water and equipment to control the fire, which is your responsibility. Anyone burning in Osage County is required to have a burn permit in all unincorporated areas. “We have had numerous out of control grass fires, burning without a permit and burning on no burn days,” Romine said. • City offices at Burlingame, Carbondale, Lyndon, Melvern, Osage City, Overbrook, Scranton and Quenemo. • Osage County clerk, land development, sheriff, extension, emergency management and USDA Service Center offices in Lyndon. Burn permits are valid for four years from the time of issue. You must contact the Osage County Sheriff Dispatch Center at (785) 828-3121 before starting a burn and after you complete a burn. More information and electronic burn permit applications can be found on the Osage County Web Site under the Emergency Management tab at http://www.osageco.org or by contacting Osage County Emergency Management at 785 828 3323 or bromine@oscosheriff.org. The National Weather Service in Topeka has issued a Red Flag Warning, which is in effect from noon today to 6 PM CST this evening. * AFFECTED AREA...Fire weather zones 040, 054, 055, 056, 058, and 059. * WIND...Sustained winds up to 25 mph with gusts of 30 to 40 mph. Strongest winds between 1 PM and 6 PM from the southwest. * HUMIDITY...Minimum humidity is expected to range from 18 to 24 percent with lowest values between 2 PM and 6 PM.